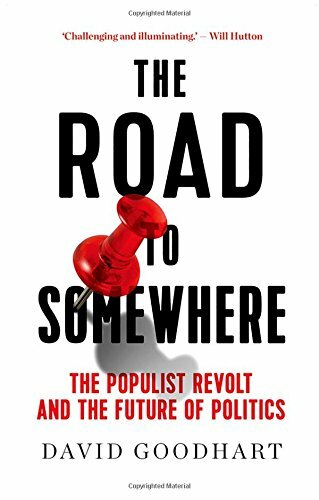 David Goodhart’s new book, The Road to Somewhere: The Populist Revolt and the Future of Politics is causing a stir. That is understandable as it addresses one of the most striking political developments of the last 12 months, seen in Brexit and Trumpism. 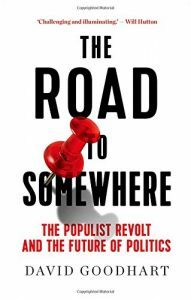 The big new political divide seems to be, not the old one between right and left, but a new one between those who are progressive and internationalist (‘anywhere’ people), and those are conservative and nationalist (‘somewhere’ people). It is a choice seen clearly in the two leading candidates in the French Presidential election, Macron and Le Pen. This is such a sharply polarised political divide that it is crucial for each side to try to understand the other, else we will tear ourselves apart. I broadly agree with Goodhart’s characterisation of the two sides, though I think they also differ in cognitive style, with ‘somewhere’ people tending to be more black-and-white in their thinking than ‘anywhere’ people. I make no secret of the fact that my sympathies are with progressive internationalists, and I would love to have a government in the UK led by someone like Emmanuel Macron, rather than the increasingly unconvincing Theresa May. You can find people in both camps who regard themselves as Christians, but it seems to pretty clear that Jesus was an ‘anywhere’ person. For one thing, it is hard to be a ‘somewhere’ person if you are a vagrant. His attitudes are also clear in the way he dissociates himself from the standard division of his time between Jews and Samaritans, and especially in his telling remarks to the Samaritan woman he meets at Jacob’s well that “a time is coming when you will worship the Father neither on this mountain nor in Jerusalem, but in spirit and in truth”. The way forward for humanity is to find some way of integrating being ‘somewhere’ and ‘anywhere’. Most of us cannot avoid between rooted in some particular place, and find a sense of identity in that. However, if global humanity is to co-exist in fruitful harmony we need some ‘anywhere’ attitudes, and a sense that human beings everywhere have something in common. We are still wrestling with that paradox. Coventry Cathedral itself provides a helpful model for how to integrate the two. It has a very strong sense of local identity, as the city whose Cathedral was bombed in 1940 but rebuilt, but which also has, arising from that local and historical fact, a passionate and enduring commitment to international reconciliation.